Even in the bubble of a film festival, where political discussions tend to revolve around who got invited to which afterparty, the real world intervenes occasionally. So it was yesterday at Fantastic Fest, where a rumor was going around that Monday’s “secret screening” would be the debate between Donald Trump and Hillary Clinton with live commentary from comedian Doug Benson, who’s been hanging around all week, trailing his signature skunky cloud of smoke behind him. That’s not at all what ended up happening, and just how off base all the predictions were this year—last year’s secret screening title was an open secret hours before its debut—is a testament to how well the festival kept it under wraps. The secrecy ended up being thematically appropriate, actually, because the film was M. Night Shyamalan’s latest, Split (Grade: B). The film isn’t slated to come out until January 20, 2017, and according to Shyamalan, it just finished post-production last week. Universal appears to be quite confident in this one, as a representative informed press before the screening that we could run reviews right away, and asked only that we refrain from giving away the twist at the end of the film. I won’t do that, but I will confirm these two things: There is one, but the main plot doesn’t revolve around it. (It mostly exists to cast the events of the film in a new light). The film itself plays like Shyamalan’s Hitchcockian take on a Silence Of The Lambs serial-killer movie, starring James McAvoy as Kevin, a man with that most cinematic of rare mental conditions: dissociative identity disorder, a.k.a. split personalities. At the opening of the film, one of Kevin’s personalities, Dennis, kidnaps three girls (Jessica Sula, Haley Lu Richardson, and The Witch’s Anya Taylor-Joy) from a birthday party at a suburban Philadelphia mall, locking them in a fortified room in the basement of his house. Not all of Kevin/Dennis’ 23 distinct personalities are so cruel, though; they manifest as different ages, genders, and sexualities, including a meek young child named Hedwig. Once the girls figure this out, they start pitting the personalities against each other. Although there are some supernatural elements to the film—mostly revolving around a heretofore un-manifested 24th personality, “The Beast”—Split functions more like a mystery-thriller with horror elements than as a horror movie, unlocking information about Kevin through his therapy sessions with Dr. Fletcher (Betty Buckley), a psychiatrist who believes that people with DID have unlocked new areas of the brain inaccessible to normal human beings. Meanwhile, we also gain information about Taylor-Joy’s Casey through a series of flashbacks showing her going buck hunting with her father and uncle. Split looks great thanks to the participation of It Follows cinematographer Mike Gioulakis, under whose lens the fluorescent lights in Kevin’s basement look extra sickly, and the dark shadows extra dark. Shyamalan also continues his creative renaissance, adding resonant details like a bathroom cabinet stuffed with 24 toothbrushes, one for each of Kevin’s personalities. But this is overwhelmingly McAvoy’s film, and he clamps down hard on a very meaty role, giving each of his character’s personalities their own unique stances and gazes as well as physical and vocal tics. Where Split falls short is when it gets a little too wrapped up in continually raising the stakes of the film, riding the line between edgy and exploitative with some revelations late in the second act. Some of McAvoy’s characterizations, particularly when he’s playing a female or homosexual personality, ride a similar line between virtuosity and hamminess, while Taylor-Joy fades into the background as a girl who’s capable but not exactly heroic. 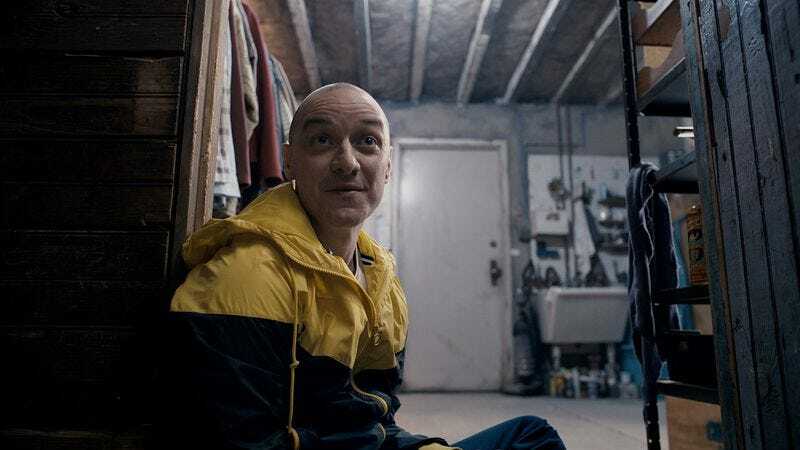 Overall, though, Split is a solid example of the type of elevated B-movie potboiler at which Shyamalan excels, and to which he thankfully seems to be re-committing his energies.